walkers to act as “eyes and ears” of their communities and report issues which they notice whilst out walking their dogs, these issues may range from dog fouling and fly tipping to anti-social behaviour, drug dealing and dangerous driving. We are inviting residents of Wolverhampton to join ‘Paws on Patrol’ and to be vigilant whilst out and about walking your dog. Many other dog owners may walk their dogs early in the morning and in the evenings, and as a result will often spot things that others wouldn’t. ‘Paws on Patrol’ is simply about being alert to what is happening in your neighbourhood whilst you are out walking your dog. As a member of Paws on Patrol and an active citizen you should then report what you see to the Police and/or other relevant partners. PLEASE BE AWARE we value you and all our residents and do not want anyone to endanger themselves by approaching anyone committing a crime. Instead please remain safe and call the Police straight away. To register for Paws on Patrol, please use the form at the bottom of this page. By submitting this form, you agree that your information may be shared with relevant third parties who can assist in providing information to respond to your query or investigate your respective crime (if reported). The information will be stored on our systems and managed in line with UK Data Protection Laws, please see our Privacy Notice for more information. I confirm that I would like to be part of Safer Wolverhampton Paws on Patrol scheme and will be the eyes and ears of the community whilst out walking my dog. 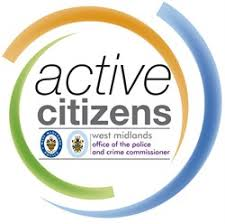 Active Citizens funding has been made available by the Office of the Police and Crime Commissioner so that West Midlands Police will be better placed to engage with the public and encourage 'active citizenship'. This means that communities in the West Midlands can become actively involved in projects that will make a positive difference. The aim of the programme is to encourage local communities and/or organisations to create small projects which will help to make their communities safer and encourage local people to get involved. Wolverhampton’s Active Citizens' is about, empowering and supporting organisations, local residents and groups to deliver their own solutions to making their community safer. We want applications for small, local projects that identify challenges to community safety and bring their own innovative solutions to tackling them; building or sustaining safer communities and creating active citizens. Dog owners who sign up to Paws on Patrol will be issued with a membership card, containing contact details for the police, Wolverhampton’s Anti-Social Behaviour Team and the Customer Services Team at the City of Wolverhampton Council. As a thank-you for becoming involvement, members will receive a reflective dog collar for their pet, a poop bag holder and poop bags. Paws on Patrol is funded by the West Midlands Police and Crime Commissioner’s Active Citizens Fund and supports the Safer Wolverhampton Partnership’s Community Safety and Harm Reduction Strategy which aims to increase the reporting of crimes, keeping neighbourhood’s safe and reducing the perceived fear of crime. West Midlands Police and Crime Commissioner David Jamieson said: "Paws on Patrol is a great idea. It builds on the principle that West Midlands Police relies on the eyes and ears of all of us in our local community to report criminal behaviour when they see and hear it taking place. "Dog walkers spend more time than many of us pacing up and down local streets, which puts them in a perfect position to keep a look out for trouble and to report it to officers. I am delighted to have helped fund this community project using the ill-gotten gains of criminals."